Grinstead Park is situated at Shand St., Alderley. (UBD Ref. Map 139 D8). 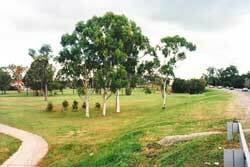 Although most of the recreational facilities are on the eastern side, the western portion also boasts many old eucalypts, and some revegetated and grassy areas. There is a bike path following parallel to the Brook from Corbett Steet that passes under the Shand Street road bridge and through to Royal Parade on the eastern side of the Park. 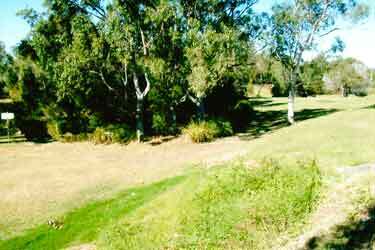 Grinstead Park Bushcare Group was formed in 1996 with Moira Lowson as Bushcare Leader to protect several native frog-breeding sites near a stand of mature eucalypts. The initial focus was on providing cover for frogs by fencing off the area to exclude mowers and allowing natural regeneration of vegetation. 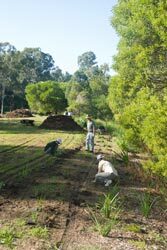 After fencing, native grasses and eucalypt seedlings emerged in dry conditions; the regeneration area was then extended. However, exotic understory became dominant following good seasonal conditions. Even so, these weeds did provide many resources for native fauna. In November 2000, a wildfire burnt the whole regeneration area.There was a total loss of understorey at the start of the frog-breeding season leaving frogs without shelter or calling sites. The fire also damaged mature trees and nesting boxes. 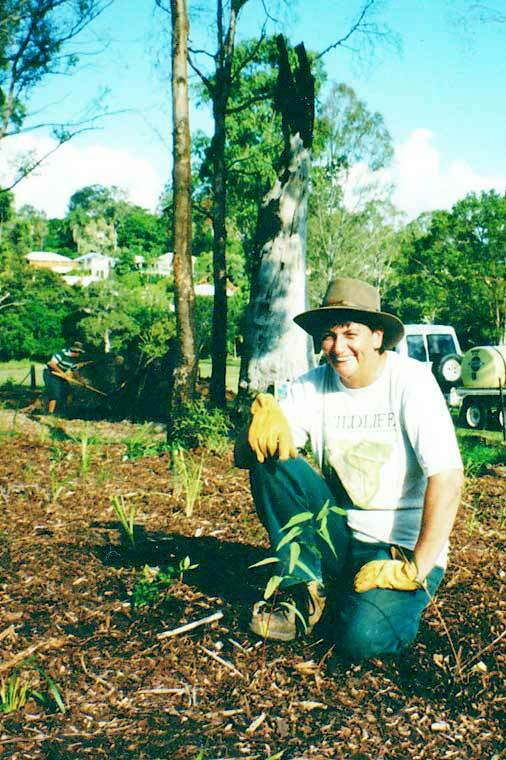 The immediate aim after the fire was to re-establish understorey plants and, with assistance from Grovely TAFE Students, 300 plants indigenous to the Brook were planted and mulched. The overall aim was to increase plant diversity and provide a habitat for wildlife in the future. Moira moved from Brisbane in 2007 having served for eleven years as Grinstead Park Bushcare Leader. Janet White took over as leader for the next three years but shifted away from Brisbane in 2010. Then, Debbie Dolby, who had been assisting at Grinstead Park for some years, kept things going until late 2012. 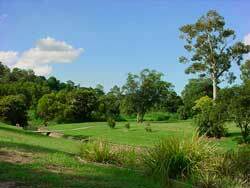 At present, the Group is not formally operating as a Habitat Brisbane Bushcare Group. Since 2000, regular planting days resulted in a great wildlife habitat. Corporate volunteers also assisted in the regetation process. Sightings of native wildlife increased accordingly. There are suitable habitats for small birds and butterflies to complement the two existing frog-breeding sites. Annual weeds emerge to provide valuable food and shelter for small birds like the Superb Fairy-wrens. For example, a Fairy-wren breeding site has been spotted in a stand of tall weeds (Thickhead – Crassicephalum crepidoides). An enormous diversity of insects have been attracted to their flowers provide plenty of food for small birds. The trends of growing density of inner city development and the numbers of aggressive pets are increasing throughout our urban environment. The use of large solid fences introduces barriers to movement for some native animals. 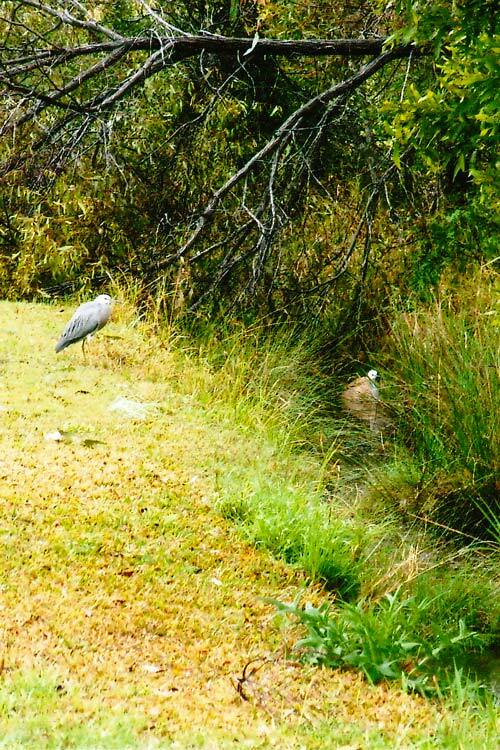 These combined factors squeeze wildlife out of the backyards they used to call home. Areas such as Grinstead Park provide native animals with habitat that is becoming scarce elsewhere. 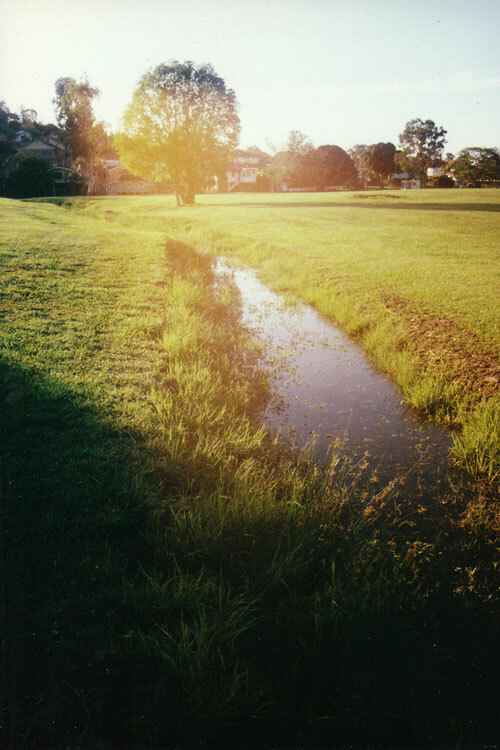 In 2010, progress in Grinstead Park was marked by the discovery of a Stoney-creek Frog near the bikeway and the strong comeback of Graceful Treefrogs. Due to the great rainfall received, weeds and vines continue to threaten to smother the habitat. The prime focus of this group was therefore to maintain a weeding emphasis to control the exotic vegetation. Grinstead Park Bushcare Group has always had a strong interest in the welfare of the local frog population. 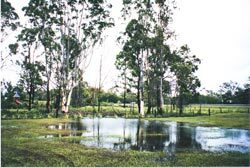 There are several areas within the park that become inundated with water after sufficient rain that attract frogs for breeding purposes. 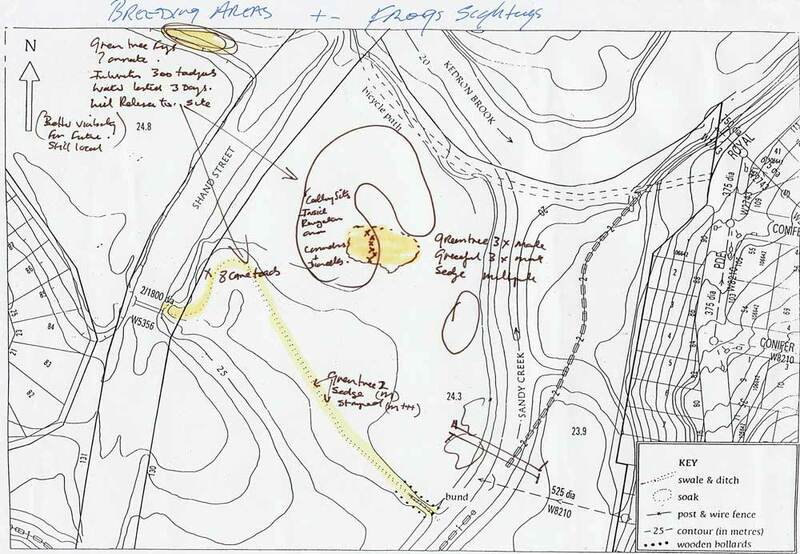 To see the location of Frog Gully and two soak areas, download an attached map of Grinstead Park used for a survey in November 2001. Frog Gully is an ephemeral frog breeding site. In 1996, a bund was installed at the Sandy Creek end of the earth drain to improve its water holding capacity. The original planting was initiated by Moira Lowson, the first leader of Grinstead Park Bushcare Group. 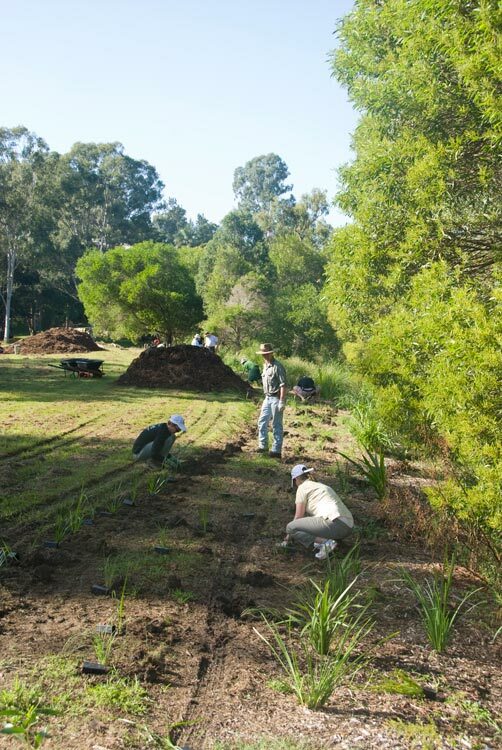 A riparian planting scheme of Lomandra spp., sedges and several acacias was planted at the Sandy Creek end of the drain. Timber bollards were inserted into the ground to protect the site from mowers. The following images show the evolution of Frog Gully from 1995. 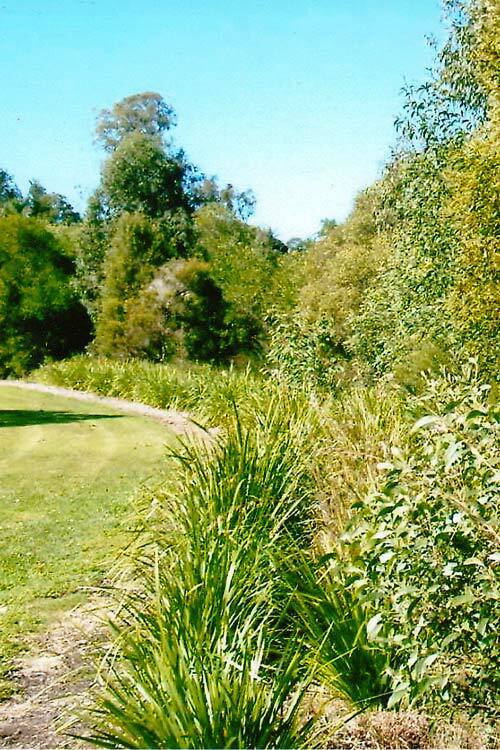 The Bushcare Group originally planted only the southern side of the drain to mimimise shading on the water body but provide frogs with protection from predators and sunlight. Tadpoles require warm to hot water temperatures to quickly complete the growth cycle from egg spawn to froglet. The northern side was then planted in 2009 to protect the gully from the invasion of exotic species and human impact. This also isolated the area a little more from aggressive land management practices. 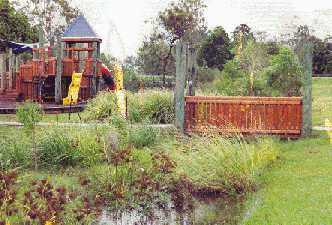 The picture right, taken sometime between 2000 to 2002, shows the gully with planted sedges and the footbridge is just down stream from the popular children's playground. 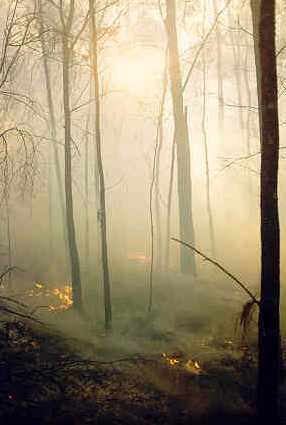 The breeding population was decimated by wildfire in summer of 2000. The photo right shows this ephemeral soak about this time after recent rain, facing towards Shand Street. The playgound is located to the left in the picture. (This soak now tends to be hidden within the vegetation of a U-shaped area that is our largest revegetation plot.) This site is only viable after heavy summer rainfall. 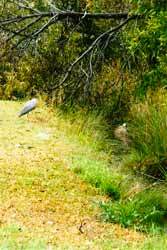 Grassy plants like Lomandra and Dianella provide good shelter and calling sites. Frogs have very specific breeding site requirements. Litoria sp. favour shallow grassland soaks. Lymnodynastes sp. favour deeper pools of water. It is interesting that all three Bushcare Leaders were deeply interested in frogs and spent a great deal of effort into maintaining their habitat. Unfortunately, this group is not currently active. For more information, contact Habitat Brisbane Officer, Fleur Sanderson, via Brisbane City Council Contact Centre number, 07-34038888.